DESIGNED TO PERFORM, BUILT TO LAST: The B01 Series is designed with strength and longevity in mind. Features: 1. Kubota Diesel Engine – Kubota is the #1 manufacturer of under 100 HP non-automotive, multi-cylinder diesel engines in the world. 2. 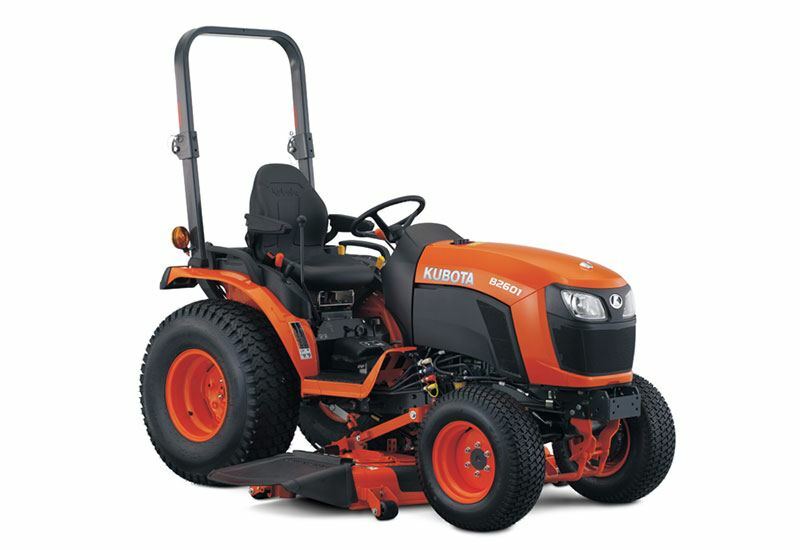 Kubota Performance Matched – The B01 Series is built by Kubota for Kubota, not a re-branded product built and distributed by multiple manufacturers. 3. Metal Hood and Fenders – Strong and durable metal hood and fenders will not only protect your equipment, but keep it looking good for a long time to come. 4. Kubota HST with 3-Range Transmission – Smooth and dependable HST Transmission with an easy-to-use range selection to optimize power output to meet your needs. FRONT HITCH: The B01 front hitch enables front implements like blades, brooms and snow blowers to be easily attached and removed, making your tractor even more versatile. EASE-OF-USE: The B01 Series is built with first time operators in mind. It features: 1. Easy-to-Use Control Layout – Ergonomic controls increase both operator comfort and safety. 2. Easy-to-Read Dash Panel – Features large gauges showing RPM, engine temperature and fuel level. 3. Larger Operator Platform – There’s plenty of foot room on our spacious operator’s platform. 4. 3-Range Hydrostat (HST) Transmission – With an easy-to-use HST paired up with a Kubota 3-range transmission, you’re sure to find the right balance of speed and torque to get the job done quickly and efficiently. 5. HST Treadle Pedal – HST models come with the Kubota Treadle Pedal, which is easy-to-use with no confusion on which pedal you are pushing, making every job faster and safer. 6. Cruise Control – Allows the operator to maintain a constant speed without keeping their foot on the HST pedal. 7. Hydraulic Independent PTO – Easy-to-use, no clutching or stopping. 8. Ready for a Long Day – Standard cup holder, tool box and large fuel tank capacity. 9. Foldable ROPS – ROPS for maximum protection, foldable for maximum convenience. COMPACT TRACTOR, BIG COMFORT: At Kubota, comfort is a top priority. The B01 Series features: 1. Wide and Flat Operator’s Station – Easy to get on and off, with plenty of leg room to increase operator comfort. 2. Modern Dash Panel – Easy to read, with all the information displayed right in front of the operator. 3. Easy to Use Controls – Simple controls that are easy to understand and operate, even for first time users. 4. Kubota Treadle Pedal Design – Effortlessly change speed and direction using Kubota’s forward and reverse treadle pedals. 5. Deluxe High Back Seat with Armrest– Increases operator comfort. 6. Tilt Steering Wheel – Allows you to adjust the steering wheel for maximum comfort. 7. Rubber Floor Mat – Reduces noise and vibration, creating a more comfortable ride and decreasing fatigue. EASY-TO-USE: Kubota designed the B01 with the first-time tractor owner in mind. Whether it’s the easy-to-use HST, great control placement or the simple-to-use PTO system, the features on the B01 Series tractor makes any operator feel like an expert. KUBOTA VERSATILITY: With a huge selection of Kubota Performance Matched implements and attachments, Kubota has what you need to get your work done. Whether it’s a front end loader, backhoe, front snow blower, mid-mount mower deck or a 3-point implement, Kubota has the right tool for the job. KUBOTA REPUTATION FOR QUALITY: Kubota is known for its quality, reliability and longevity. You can’t fake a good reputation – it can only be awarded to you by your satisfied customers. KUBOTA QUALITY AND DURABILITY: With its Kubota engine and powertrain, the Kubota built B01 Series sets the standard for quality and durability. Adding to the longevity and strength are the metal hood and fenders, designed to last in the toughest conditions.